CHRISTMAS angels are coming to the aid of clubbers in Oldham town centre over the festive period. 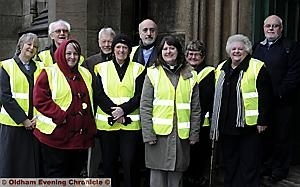 Dealing with drunks and clearing up booze bottles and vomit is all in a night’s work for the Street Angels volunteers. The six-week pilot scheme sees the hardy band of 15 helpers in force from 11pm until 3am on a Saturday night. And the plucky team is poised for its busiest weekend when revellers flock to the town centre for celebrations on the last full weekend before Christmas. The scheme, by Oldham’s Town Centre Chaplaincy, is backed by Oldham Council and Greater Manchester Police – and works closely with St John Ambulance. When the project finishes after the New Year, the group will pause for review before hopefully continuing as an on-going support. They are attempting to find funding or donations for a building to provide a “cafe” and warm clothing, as they spend hours on the cold winter streets.